I've heard of all different sorts of fixing sprays for manicures, but this is my first time trying one for myself. 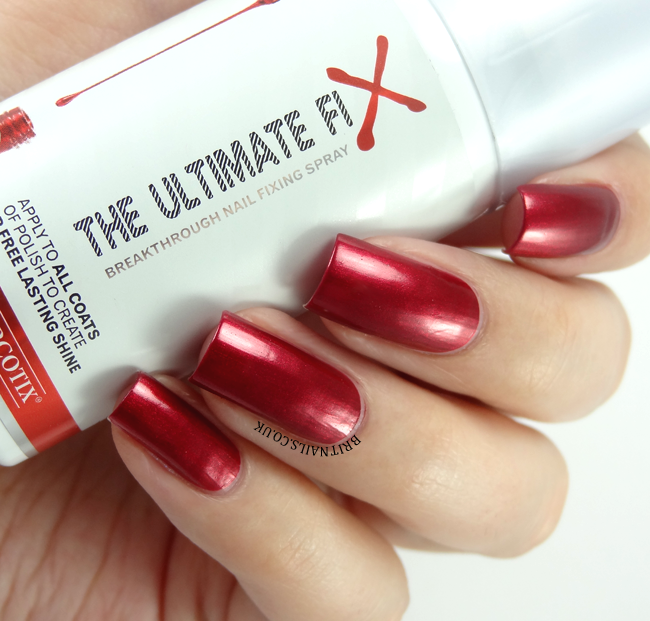 Step forward The Ultimate Fix from Beauty Narcotix! 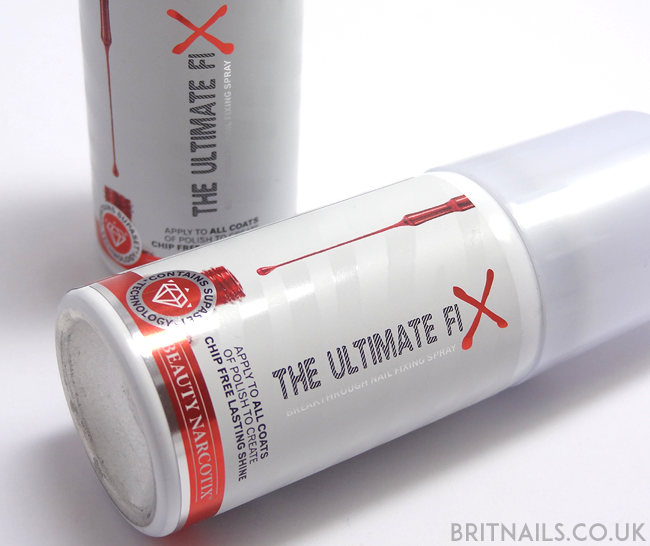 The Ultimate Fix claims to dry your manicure in 5-10 minutes and keep it long lasting and chip free, and it contains no nasties such as CFC's and parabens. You can use it on all layers of your manicure including top coats and base coats - the non-greasy formula means you can paint over the top of it. "When applied, Ultimate Fix™ penetrates the surface of the (freshly applied and still wet) enamel, the special blend of solvents then combine with the ingredients in the enamel at the surface to modify the evaporation profile of the formulation, accelerating the overall drying rate." Sounds pretty fancy doesn't it!? So, does it actually work? I can't comment too much on the chip-free claim because I don't keep manicures on for long (the life of a nail blogger!) but that isn't what I would use it for anyway - I'm more interested in the dry time, and I'm happy to say it's great for that! I applied 1 coat of a-england Perceval, a quick spray of The Ultimate Fix, followed by another coat of polish and a final spritz of spray. As you can see on my nails, it left no residue at all, and I'd say it took just over 5 minutes to be completely dry. It's recommended that you hold the can about 30cm away from your nails, and a quick 2 second spritz is all you need. There's no need to worry about it getting on your skin either, it's harmless and disappears in seconds. I'm pretty impressed with it, I've been using it quite a lot recently! The only thing I'm not so keen on is the scent - it smells like men's deodorant, which is quite strong at first but fades after a while. I suppose it's better than smelling like chemicals, but I'd prefer scent-free! 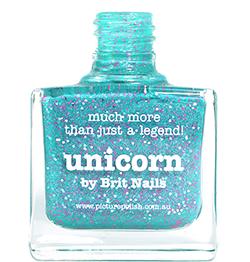 Also be aware that this is not for use on gel nails. A couple of people have expressed interest in the ingredients list, so here's the full list from the can: Dimethyl Ether, Pentane, Alcohol denat., Parfum, Menthyl lactate, Benzophenone-3, Limonene, Coumarin, Linalool, Hydroxycitronellal, Hydroxyisohexyl 3-cyclohexene carboxaldehyde. Have you tried drying spray before? What's your go-to product? That sounds interesting. So far I have only used the oil based drying drops or sprays, but I did not really like the greasy feeling these left behind. Spraying from 30cm from your nails sounds like a lot of product is just vanishing into the air, though, and I wonder how long 50ml will last. It says up to 12 manicures (just added that in!) for the small bottle. I think I'll probably get a few more out of it than that though!